Full Conference Early Bird Discount. Includes all scheduled conference activities: Wednesday night welcome reception; Thursday meetings, seminars, evening barbeque at Grayson’s; Friday bus tour & lunch, evening awards dinner. Also includes one official conference polo shirt. Full Conference. Includes all scheduled conference activities: Wednesday night welcome reception; Thursday meetings, seminars, evening barbeque at Grayson’s; Friday bus tour & lunch, evening awards dinner. Does not include conference polo shirt. Early discount ends March 25, 2019. Final registration ends April 15, 2019. The 8th Annual Jefferson Highway Conference will be held in the oldest city in the Louisiana Purchase - Natchitoches (pronounced nack-a-tish), Louisiana. 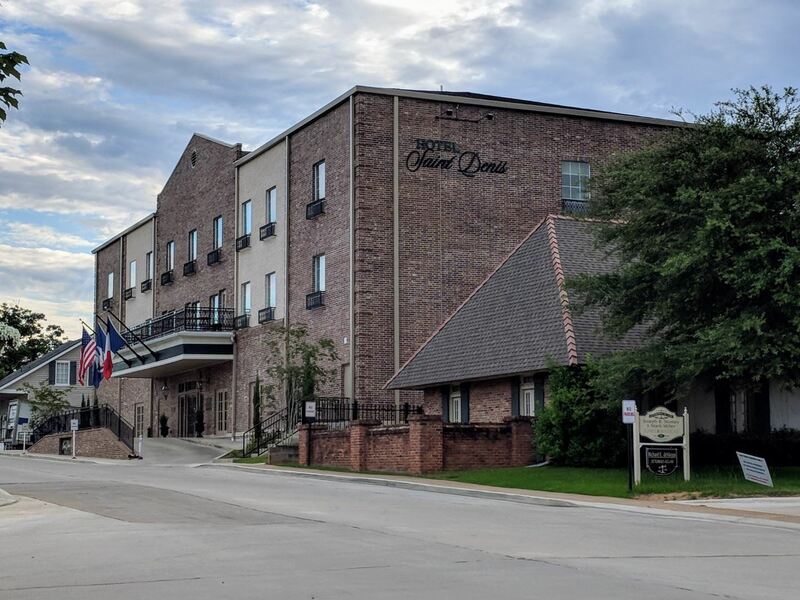 The Chateau Saint Denis Hotel, a French Creole inspired boutique property, is located in downtown Natchitoches in a 33-block National Historic Landmark District. Brick paved streets, gas lanterns, and wrought iron details adorn the area. Tourist sites, good restaurants, and shopping are all within close walking distance. For photos of the hotel and room information, see the hotel’s web page at www.chateaustdenis.com. For reservations, call (318) 951-4105. The JHA has rooms blocked for Wednesday, April 24, through Saturday, April 27. Be sure to say you are with the Jefferson Highway Association. Our agreement with the hotel states that rates will not be changed later for guests who fail to identify their affiliation at the time the reservation is made. Rates are $119 per night, single, double or triple occupancy, plus state and local taxes, which are currently 14.95 %. These room rates include their Value-Added Package consisting of breakfast buffet; 24-hour business center wireless internet access; 24-hour fitness center; and unlimited local and long-distance calling. IMPORTANT: Rooms will be held for the JHA group until March 25, 2019. After this date, rooms will be released back to the hotel and any later requests will be met on a space-available basis. Also, cancellations must be made 72 hours prior to the date of arrival. This hotel enforces one night’s room rent plus taxes and fees for late cancellations. Don’t delay! Call (318) 951-4105 for your room reservation NOW!